Yet another entry in Japan’s long line of delirious horror-action hybrids, Sion Sono’s latest feature is a Lynchian bad-acid trip into a nightmarish landscape of frightening forests, schoolgirl titillation, and weddings gone bad. Student Mitsuko (Reina Triendl) is traveling on a bus along with her female classmates when they experience a strong gust of wind. While Mitsuko leans down to pick up a pen she’s dropped, the wind rips the top off the bus, along with the top half of all the other girls, the teacher, and the bus driver’s head. Mitsuko then stands up to see the lower half of her friends’ carcasses spraying blood. With some kind of sentience, the wind returns, angling to kill Mitsuko, but she flees the bus and runs down the road, having to step around her friends’ upper parts as she does so. Some hikers and some bikers don’t fare as well as Mitsuko and are likewise cut in half. In the woods, Mitsuko comes across the bissected bodies of other schoolgirls, borrows a fresh top from one corpse, and flees back to her school, where her classmates—whom she doesn’t recognize—are surprised to see her in such a state of horror and confusion. Things quickly seem to return to a quiet normalcy. 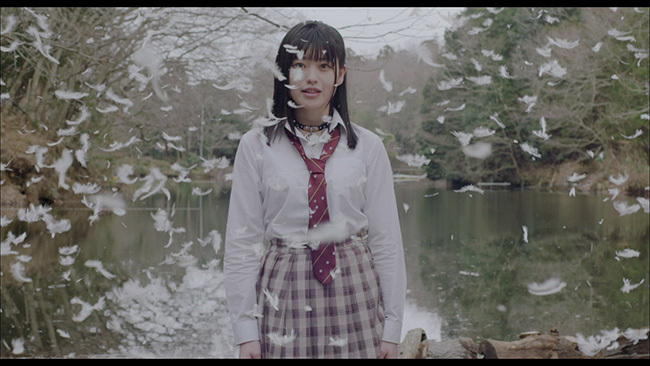 Mitsuko and her friends skip class to visit a nearby lake, where one of the other girls, Sur (Ami Tomite), tells everyone about the multiverse, the scientific theory that there are many parallel universes wherein the same people dwell but carry out different actions. To illustrate her point, she throws a rock into the water, suggesting that, in another universe, another version of her does not throw the rock into the water. The water is also a metaphor for the parallel universes, with each ripple representing the wave of a single action through time and space. 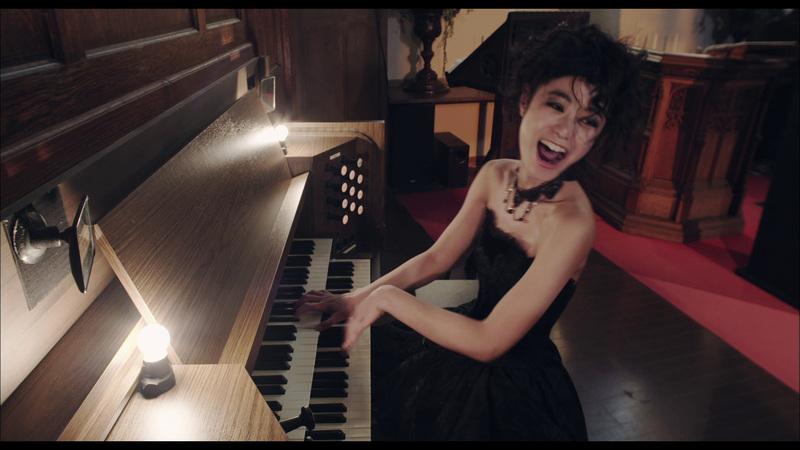 She then tells Mitsuko that life is surreal, a phrase that will return to Mitsuko many times. Shortly thereafter, the girls return to school, only to experience their teachers opening fire on them, killing most of the school’s attendants. Mitsuko escapes to the nearest town, where she soon realizes that she isn’t Mitsuko at all, but a much older younger woman named Keiko (Mariko Shinoda), who is preparing to partake in a wedding. 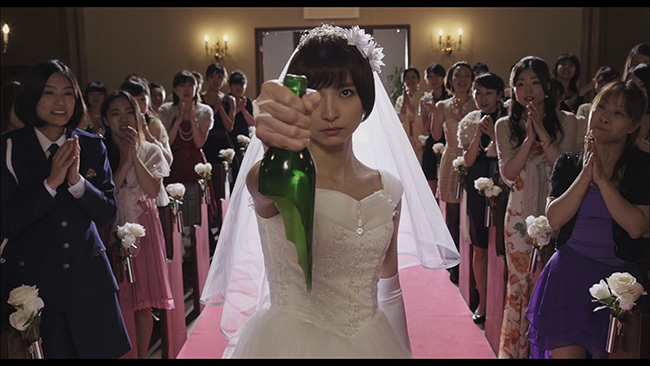 Things turn deadly, however, when most of the wedding party is slaughtered, and Keiko is forced to fight her way out of the situation. From there on, the film grows progressively weirder until the expected denouement, which may or may not explain things. Originally titled Riaru onigokko (literal translation: Real Tag), Tag hails from writer/director Sion Sono, considered by many to be the most subversive of all Japanese filmmakers (a mean feat considering the stiff competition he receives from fellow auteur Takashi Miike). Sono’s career began with Bicycle Sighs in 1990, after which he turned his sights on the horror genre with The Room (1992). While he has worked across genres, it’s his films that sit astride the horror and action genres that have brought him the most acclaim and derision, often finding release outside of Asia and gaining him a worldwide fanbase. Some reviewers have been quick to accuse Sono of misogyny, but a closer look at his work—and at Tag in particular—reveals a nuanced and intelligent approach to gender issues. While some of his films are fairly standard coming-of-age melodramas, his horror work is far from standard, and Tag is no exception. While the story seems to follow a linear path, it still throws a number of curveballs, thwarting audience expectations at every turn. In that respect, it’s more akin to Miike’s brilliant Audition (1999) than it is Kinji Fukasaku’s challenging Battle Royale (2000), both excellent films in their own right. Sono understands that stories don’t have to be orthodox in their telling, and he doesn’t have to be orthodox in his directorial approach. Even when its mysteries are seemingly revealed, Tag leaves the viewer with doubts, and as the end credits role, Sono’s unique vision remains fascinating and confusing and bleak in equal measure. Tag comes to British Blu-ray via Eureka’s Classics line with an MPEG-4 AVC encode in 1080p high definition. The film is presented in its original theatrical ratio of 1.85:1 and is locked to Region B. Some reviewers are calling the image soft and muted; but while the latter may be true, the former most definitely is not, other than in a few shots containing optical or CGI effects (such as during the opening credits or during scenes of visceral carnage), and those are used in moderation. 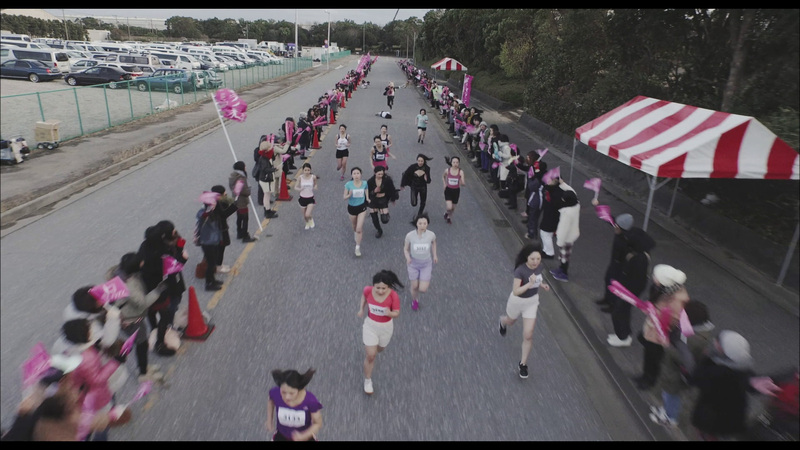 Rather, the film is often very sharp, particularly when Sono’s camera is flying over Japanese forests or creeping along the forest floor. Autumn leaves on the cusp of winter, blowing in the wind or lying underfoot, reveal just how clear and sharp the image can be and often is; snow-peaked mountains in the distance reveal how layered and deep the frame is. This is a beautifully textured presentation gorgeously rendered on Blu. Housed on a BD25 with few extras, the bitrate is relatively high, ensuring that there are no compression artifacts. There’s a nice patina of grain added to the digitally shot picture to give it a more filmic look, and while this doesn’t entirely work, it’s doubtful there will be many complaints. As noted above, colors tend toward brown or slightly faded, and much of the image is white or pale, clearly a directorial choice designed to enhance the autumn-verging-on-winter look. Sono picked this time of year for a reason, and the result is as surreal as the storyline. Unlike the other colors, however, the blood is generally dark, red, and realistic. It seems strange, then, that Eureka would opt for Japanese 2.0 DTS-HD Master Audio for the film’s primary track. Though Eureka’s website states that the film also comes with a 5.1 surround option, no such track is available on the check disc submitted to Rock! Shock! Pop! for review. While lossless, the sound and sound effects are limited in their punch, though otherwise the track is quite good and without issue. Then again, this is a film shot a mere two-plus years ago, so hiss and dropout shouldn’t be a problem regardless. The score as well as various songs on the track are sharp and pleasant. Dialogue is crisp and clean, and there are no serious jumps in sound (or sound quality). There are, of course, English subtitles for those who can’t follow the Japanese language. Unfortunately, Eureka has included only one extra, the original Japanese theatrical trailer (1:08). This is a film calling out for an audio commentary or making-of feature that offers insight into its weird world. The Blu-ray also comes with a DVD. Eureka has once again given to the West a superlative example of East Asian filmmaking in the form of Sion Sono’s modern-day classic Tag. The image looks terrific, and while there isn’t a surround mix (at least not on the disc we received), the soundtrack is solid as well. There are few extras, but the film itself should be more than enough to hold viewers’ interests for its relatively short 85-minute running time.